The Most Famous Furry in the World? It’s quite possible that Mickey Mouse could well be that — though, of course, Bugs Bunny could also be considered a serious contender. Still, The Mouse has been around the longest, and author Garry Apgar decided to take a look what possibly accounts for Mickey’s world-wide appeal in a new hardcover book. “Since his modest debut in 1928, Walt Disney’s Mickey Mouse has evolved into arguably the world’s most recognized and beloved fictional figure. Mickey Mouse: Emblem of the American Spirit is the illustrated biography of a unique cartoon character, his life and times, and his impact and influence around the world in art and literature. 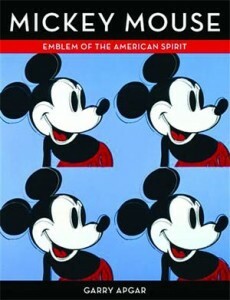 Part art history and part cultural study, Apgar’s Mickey Mouse narrates how the character was initially developed by Walt Disney and Ub Iwerks, how his irrepressible spirit grew to huge popularity during the Depression, and how he became a politically charged cultural icon of international reach.” You can order the book at Midtown Comics. It’s coming later this month from Simon & Schuster.